It's chilly enough in my neck of the woods to appreciate a cup of hot coffee, tea or cocoa. 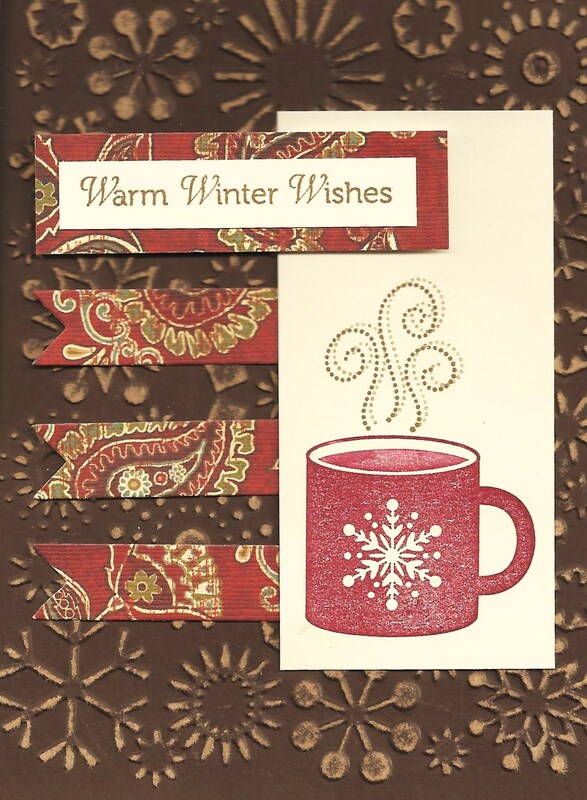 This card works a treat for Christmas wishes or to send a thoughtful note to a friend on a cold winter's day. I was itching to break out my new SU Scentsational Season stamp set, featuring a gingerbread man, candy cane, Christmas tree and warm cuppa. Although I didn't use it on this project, the stamp set also has a coordinating SU Framelits die, so that you can easily trim out these stamped images. The background features Stampin' Up! 's new Early Espresso ColorCore card stock, which is designed for easy distressing with a sanding block. The sanding quickly reveals a lighter core inside this card stock, which also comes in two Christmassy shades of Cherry Cobbler and Gumball Green. Before distressing your card stock, select an embossing folder that complements your design and run it through your embossing machine. Then lay the embossed card flat, and use the sanding block to remove the top layer of the ColorCore card stock. The little flags used as accents were created with the SU Bitty Banners Framelits. 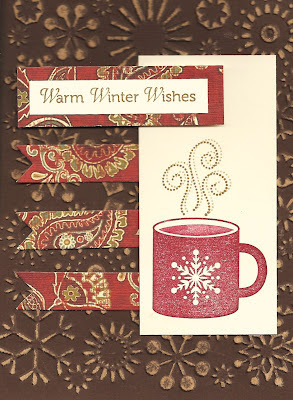 The sentiment Warm Winter Wishes comes from the new SU Winter Memories stamp set. SU inks used include Soft Suede and Cherry Cobbler.